Today, we feast on The Wig in the Window by Kristen Kittscher and The Colors of Madeline by Jaclyn Moriarty. Wow. It’s hard to believe that The Wig in the Window is Kristen Kittscher’s debut novel because believe me when I say this book is fantastic. 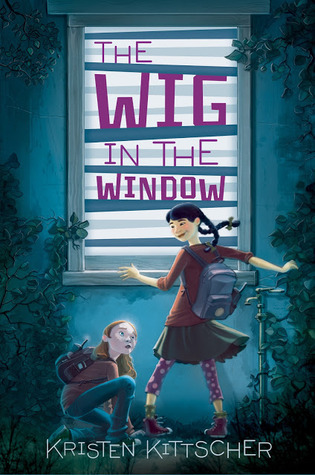 Part spy-mystery (in the vein of a young Nancy Drew), part contemporary middle grade novel about friendships, change and consequences, The Wig in the Window is a smart, fun read that is as powerful as it is witty. I loved The Wig in the Window wholeheartedly, and cannot wait for more Young and Yang. Absolutely recommended, and solidly in the running as one of my Top 10 Books of 2013. 12-year-old Sophie Young and Grace Yang are neighbours, best friends and amateur sleuths with a penchant for getting in trouble. When the two sneak out at night to investigate their mysterious neighbour (who is also Sophie’s school counsellor) Charlotte Agford, they stumble across a dangerous plot with real-life repercussions. As the mystery build-up and real FBI agents get involved, Young and Yang find themselves wondering if they have bitten more than they can chew. Worst of all, they find out that there are things that even the strongest friendship cannot survive. The Wig in the Window is a book that strides deftly across genres and is part mystery, part contemporary fiction dealing with issues such as friendship, prejudices and cultural appropriation. The latter is where the novel truly shone for me and I completely agree with Thea’s take on what makes this novel so strong: the relationship between the two main characters which is strained and heartfelt and so, so real because of those. They have their ups and down, break ups and make ups and all of that reminded me of every relationship I had at that age. That’s all awesome and the best reason for anyone to read the book. That brings me to the actual plot of the novel with the mystery surrounding Charlotte Agford and my own personal reaction to that side of the story. On the one hand, the actual mystery is very well done, unpredictable and it had me guessing till the very end. On the other hand, I always have a hard time suspending disbelief when it comes to MG and YA mystery novels featuring kid-sleuths. I always wonder how realistic is it that a pair of untrained 12-year-olds are more capable than the police and the FBI put together. Or that when things are finally revealed, all the law-breaking done by the kids in the pursue of these criminals are just forgotten and forgiven. And I know this is not the correct frame of mind one must have when coming into these types of stories but it is unfortunately, inevitably where my mind goes. This mean I am probably not the right audience kid-sleuthing books but if you are? I am sure you could do no better than The Wig in the Window. A Corner of White is a book that expects a certain level of commitment and patience from its readers. And maybe not everybody might be invested in the type of story it tells or have the patience to see it unfold slowly. Slowly is the key word here because the stories, or rather the story it tells (because it’s just one, really, at the end of the day) is developed carefully and insidiously. If you like Hilary Mckay, Megan Whalen Turner, Jennifer Nielsen and the way their books play with narrative in clever ways? You must read this. A Corner of White is a well-written book. I know it appeals to many people and certain audiences. It is whimsical and humorous, filled with quirky characters and a great underlying concept, i.e. the juxtaposition of the ever-changing seasons of Cello and its rogue colors, against the less vibrant real World (called simply, “the World”) is wonderfully positioned. And yet…A Corner of White and I simply did not hit it off. We are not BFFs; we are not soulmates. This is not a failing of the book, but rather a simple matter of incongruity and incompatibility. In other words: it’s not you, book. It’s me. I digress. 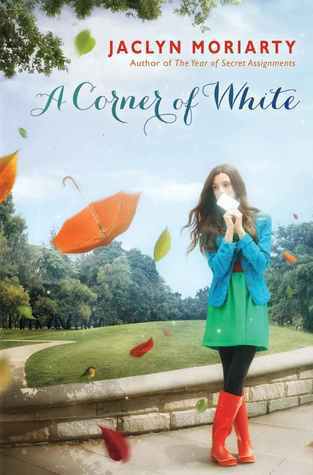 A Corner of White is a charming book – the story takes place in both the Kingdom of Cello (a fantasy land where seasons last for mere days, colors run rogue and are capable of killing a person, and technology runs at a slightly different pace), and our more familiar World. Madeleine is a beautiful young woman who used to live in the lap of luxury, until the day her mother suddenly decided to run away from her father, whisking Madeline away from yachts and private jets to drizzly Cambridge, England. Here, Madeline consumes a number of beans (yes, beans) because this is all her mother knows how to cook and can afford, dresses in bright colors, and spends time with her two other homeschooled friends. Meanwhile, Madeline’s mother sits day after day watching and practicing for her spot on a quiz show (she gets every single answer wrong). In the Kingdom of Cello, Elliot is a young man singularly bent on discovering the whereabouts of his missing father (who is rumored to have run off with the school physics teacher). Before embarking on a dangerous journey confronting some rogue Violets, Elliot is convinced by his mother to stick around his home farm town of Bonfire, to help put together a pyramid of pumpkins, play some baseball, and hang out with his friends (who hang on to his every word because he’s just that charismatic and wonderful). One day, Madeline discovers a connection between the World and the mysterious land of Cello, and begins exchanging notes with young Elliot – their fates are intertwined, despite being worlds apart. Sounds intriguing, right?! A Corner of White, however, never really actually capitalizes on this promise. Alternating between the World and Cello, there are a lot of WORDS in this book and plenty of whimsical quips and quirky touches for Madeline and Elliot. But… it’s so much whimsy and quirk that it quickly grows tiresome and feels entirely pointless (or, rather, that there is so much whimsy and quirk merely for the sake of whimsy and quirk). There are pages upon pages of excerpts from travelling princesses of Cello, who flitter on about how WONDERFUL the different towns they’ve visited are and how DARLING everything is (interspersed with editor’s notes correcting errors and clarifying gramatical/vocabulary choices). There is much time spent with both of the book’s main characters, Madeline and Elliot, but it’s hard to truly care for either of them because they are so superficially quirky without any deeper connection (also, I am not endeared to Madeline, as clearly her mother is SICK and she sort of halfheartedly worries about getting her mother to a doctor, only to forget about it and continue on her own self-absorbed storyline for another 100 pages). Furthermore, I know there’s a plot in here somewhere and an eventual convergence of storylines, and perhaps I’m simply impatient because I found myself getting irritated with the lack of a story (and similar lack of character building) for the first half of the novel. And without a story, and without robust characters it all felt like a lot of style without any actual substance. Not to mention the concept of Colors and the whimsy of Cello – complete with killing Colors – sounds very much like Jasper Fforde’s Shades of Grey. Unfortunately, this is a comparison that I could not get out of my head, and one that is not favorable for A Corner of White (Shades of Grey is also whimsical and hilarious, but has a story that moves and characters who ring as far more genuine to me). Rating: DNF – as much as it pains me to say it, I could not finish this book. After a few days of picking it up and putting it down, I called it quits. Both of these sound good, actually. A Corner of White has a promising premise. Hopefully I’ll be like Ana and like it!! As for Wig in the Window, while I did read some Nancy Drew mysteries (I just couldn’t get on with the fourth one, sadly, so I’ve only read three. Oh well,) I’m not a huge middle-grad sleuth reader. However, Wig in the Window sounds whimsical, quirky, and although not very meaty, a good fun read, maybe a bed time story perhaps. I don’t know. 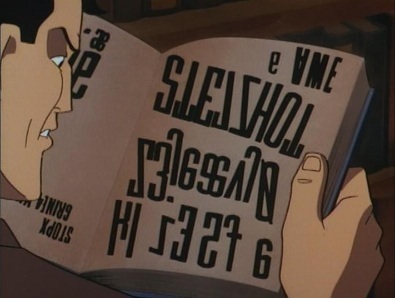 Well, that’s one bookaholic’s opinion, I suppose. While none of these are perfectly in my reading comfort zone, I refuse to shut out an entire genre (except for erotica. A book can have erotica but it cannot be just about it otherwise…just NO. NO,) so I will have to try both of these and see what I think! sounds very much like Jasper Fforde’s Shades of Grey. Hmm. That’s interesting, because even though I adore all of Fforde’s other books, I hated SHADES OF GREY — precisely because, even though I liked the premise, I disliked the characters and thought the story never went anywhere. So maybe A CORNER OF WHITE will work for me! Thea, I agree with you completely about A Corner of White. The writing style was good, the world was imaginative, but it was completely character driven, and the characters where so unrealistic! I didn’t understand Madeline at all, she just seemed like a MPDG to me–quirky affectation, flighty, mysterious…with not very much underneath. I finished it because I loved the Kingdom of Cello so much and the different regions were so inventive but I don’t think I’ll be back. Definitely going to check out Shades of Grey though. I’m about a quarter of the way through A Corner of White and feeling the same ambivalence. I keep putting it down and starting something else because the quirkiness and quality of the writing hold me for a few pages and then I get frustrated waiting for the plot to start. I felt similarly to Thea about A Corner of White. I’ve catching up with Jaclyn Moriarty’s Ashbury/Brookfield novels, but A Corner of White took so long to get going that when events did start happening I couldn’t manage to drum up much enthusiasm. I think the book suffered from an overabundance of characters – Elliot’s friends and acquaintances would have blurred together for me even if it had only been set in the Kingdom of Cello, but with the Cambridge-set parts as well, I found it very difficult to keep track or develop a strong interest in them. This book does take longer to get going than maybe it should. However, on the grace on the Ashbury/Brookfield novels (and those books bought a lot of grace from me), I gave Moriarty the time to develop her characters. Yes, Madeline is selfish and self-absorbed. (1) She’s a teen and (2) completely spoiled. No, I didn’t like her at first and, frankly, I’m still more than a bit iffy on her; however, just like Bindy, more layers are revealed (apparently too late for some) and you get to see behind the mask she’s been wearing – both for others and herself. I think there is potential for this character in the other books. Moriarty plays the long game with her characters and given the glimpses we see towards the end, I’m willing to see what she does with Madeline – and the other characters. I loved the whole Kingdom of Cello and really want to find out more about it. Also, why does Cello know about “The World” but not the other way around? I really enjoyed Princess Ko. I figured the flightiness of her dispatches served a purpose and I was right. I’m hoping the next book features her more. Anyway, if you’re reading this book and feeling it’s a bit slow but are still intrigued with aspects of it, hang in there. Many of the threads start knitting together and becomes a stronger story because of that. Hannah – How are you liking the Ashbury/Brookfield books? In the comments for the original review, you had only read Feeling Sorry for Celia but were going to read the other ones? Which ones have you read? What do you think? Have you joined our fan club? Damn, I think you just convinced me to read the second one! Kendra – Hee! Given that Ana is a fan, I’m sure that we can meet back here to discuss the 2nd book once it’s been released. We can see if our faith has been upheld. I think it will be. Thanks for the comments, guys!!! Eliza – I totally get what you’re saying and Ana has assured me that everything comes together beautifully and wonderfully by the end of the book. That said… I simply didn’t care enough about the story, the characters, or the world to keep going, even with the assurance of a future payoff. Maybe I’ll give Moriarty’s Ashbury/Brookfield books a try, but The Colors of Madeline and I were on separate wavelenghts (or, different parts of the visible light spectrum). And if you’re not enjoying what you’re reading, why continue to read it? That said, I really do encourage everyone to give it a try! It didn’t work for me, but that’s not necessarily true for everyone else. hapax – YUP it is *very* similar to Shades of Grey… which I absolutely LOVED. Hah! I’m curious to see what you think of this book! Sarah, Kendra & Hannah – I highly recommend Fforde’s Shades of Grey. Lots of the same qualities as this book but with a more unique and fascinating world (in my opinion), plus robust characters and a moving storyline. Of course, your mileage may vary, but I personally loved it! Thea – I also get where you’re coming from. There have been books others have LOVED, and I’m all “HUH? Really? What’s the big deal here? Yawn. Next . . . ” Sounds like you gave it a fair shake and that’s all you can ask for. That said, do try her Ashbury/Brookfield books. They were my delighted find last summer. That series and the Montmaray Journals were the series I loved best last year. I was so glad that they were completed by the time I started them. I didn’t have to wait for the next one to come out. I could just immerse myself into those worlds.